He survived to have a heart transplant within 24 hours of going on the waiting list. 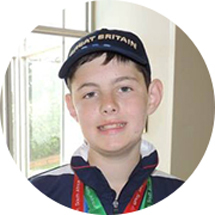 Rhys, from Borough Green, Kent, represented Great Britain in swimming at the World Transplant Games, achieving two gold, two silver and one bronze medal. This follows him winning four gold medals at the British Transplant Games. His mum, Rowena, said: "Four years ago we had a fit healthy boy who contracted a virus that quickly destroyed his heart." "Our only option was to receive a new heart otherwise he would have died." "Thankfully Rhys got the greatest gift ever due to the selflessness of an individual and their family who had signed up to the organ donor register." "A day doesn't go by when we don't appreciate how lucky we are to still have our son, and our thoughts and thanks are always with his donor and family."